Sponsor community events and activities, such as Prescott Valley Days, Battle of the Bands, Amphitheater events, concerts, etc. Help businesses with issues such as signage, zoning questions, etc. The Prescott Valley Chamber of Commerce is proactive and aggressive in its support, promotion and representation of its business membership. It has a talented and professional staff that is available to assist you with business needs and questions. We welcome you to join us and get involved with this wonderful community. 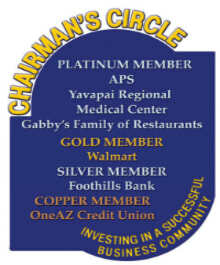 Please contact us at 928-772-8857 or visit our website at www.pvchamber.org.